DVET Maharashtra ITI Admission 2019 application and official notification are expected to release in the month of June 2019. All the application forms will be made available on the official web portal of the conducting body. Department of Vocational Education & Training (DVET), Maharashtra is the department under the State Government of Maharashtra that conducts an online process every year for the admission of candidates into various government or private Industrial Training Institutes (ITIs) of the state. Interested candidates will get all the necessary details regarding DVET Maharashtra ITI admissions 2019 in the given article. It includes information about the admission application such as application form, schedule, fee, eligibility criteria, trades, result, counseling etc. The duration of these ITI programs/trades vary that can be from one year to three years. For more information regarding the ITI trades, readers can visit the official portal of DVET, Maharashtra or they have to wait for the 2019 information brochure. However, we will also update the same information here on this page. The official schedule to be updated soon. Before going to fill the online application fee, candidates are advised to read the information brochure first in order to get complete information about the eligibility criteria and other details. Candidates should be from Maharashtra. In case the candidate is not from Maharashtra, he/she have to follow the other criteria. The minimum age of the candidate must be 14 years at the time of admission. Candidates must have qualified SSC (class 10th) from a recognized Board. Appearing candidates can also eligible to apply. Interested candidates have to apply only through the online mode as no other mode is applicable. They can apply through a single application for admission into various ITIs of the state. No multiple applications are required. Visit the official website of the DVET. Hit the student’s link or link provided on the homepage of the portal. Provide all the details and register. An ID and password will be generated. Now login with the ID and password. Enter all the personal details, parent’s/guardian details, address details, entry qualification details and other necessary information asked in the application form. Upload the scanned copies of all the required documents. Make payment of the prescribed application fee. Check and review the details before final submission. Lastly, take a print out of the application form for future references. In this step, fresh candidates have to register themselves by providing the necessary information such as the mobile number and email address. Those who have already registered can skip this step. In this step, applicants have to submit the online application form by filling all the required information. In this stage, the application of the applicant will be confirmed by the conducting authority on the basis of the selection criteria. DVET, Maharashtra will finally allot seats to the candidates on the basis of the data of the applicants. The last and the final step is the admission of the candidate to the allotted Institute. Applicants have to carry all the required documents to the allotted institute for verification. Applicants have to pay a certain amount of the application fee depending on their category. The application fee is to be paid through the online mode. It is non-refundable in nature. Note: Reservation percentage for all the categories changed as per the rules and policy of the State Government. Once the application is confirmed, seats will be allotted to the candidates on the basis of application, preferences filled and other factors. After the allocation of seats, candidates have to report to the allotted institute at the specified time. It is compulsory for all the participants to carry all the required documents (original plus photocopy) to the institution. Once candidates have submitted the admission fee in the respective institution they are advised to collect the candidate’s copy or admission confirmation slip from the concerned department of the institution. 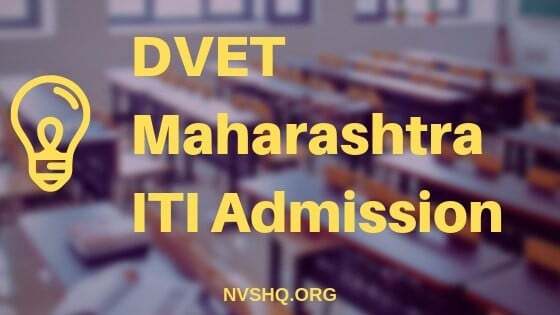 DVET Maharashtra ITI Admission online application form is expected to release in the month of June 2019. The application is provisional and mere submitting the online application does not confirm the admission of the applicants. They are required to satisfy all the eligibility requirements and other conditions in order to secure admission. Candidates are advised to go through all the instructions regarding the admission and must ensure that they fulfill the eligibility criteria before applying. Candidates must carry all the original documents at the time of admission. Candidates will be notified and intimated through the official web portal of the conducting authority and also through the registered mobile numbers and emails. Applicants can also get the updates and important information such as seat allotment from the android app MahaITI App. They just have to download it from Google Play. Candidates who have not been allotted any seat in the first phase have to wait for the remaining phases of seat allotment. Bookmarks us to get latest and updated information at one place. Our team always try to find ways to help candidate/aspirants in any possible way. You can ask us your questions in discussion section below and we will reply to you in shortest time possible.